Many different types of organization try to campaign and there many designs of campaign but campaign design at an organizational level, and management of campaigns, are subjects that get relatively little attention. Here are a few ideas that may help. Internal conflicts and dysfunction can arise because campaigners don’t know much about management but ‘rise through the ranks’ and find themselves as Campaign Directors or similar, where they encounter other managers or boards of governance (etc) with little or no understanding of how to actually campaign in practice but who may bring with them management assumptions or theories with little application to campaigns. In addition, although people in campaign groups have often at least heard of things like ‘framing’ (eg George Lakoff’s work) and may use such terms all the time, they often do not realise that assumptions about which is the right way to make a decision or to organise something, are themselves framed by unconsciously imported assumptions. Mostly these were embedded long ago in some academic course, management school or simply picked up through serendipity. This even applies to competing frames for campaigning itself. Individual campaigners may have no any overt management role but this is still relevant to them, as the plausible options to design any individual campaign are determined as much by what sort of organisation is doing the campaign, as by the external task and circumstances. Spending a lot of time developing campaign options for which an organisation lacks the will, assets, skills or resources, is a waste of time. 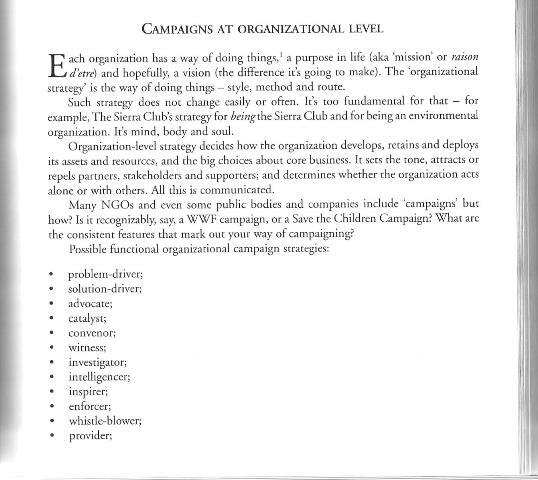 In How to Win Campaigns: Communications for Change I discuss how at the level of organizational strategy or ‘the brand’, campaign groups need to determine what their primary role is or way of doing campaigns. For instance a campaign group might be primarily a convenor, a witness, an investigator or many other things. It should design strategy around using a ‘best tactic’: the ‘Strategy of Tactical positioning’ proposed long ago by Sun Tzu. A common divergence is between groups who think about planning and making choices over which campaigns to run in terms of targets to change, and those who think in terms of ‘issues’ or areas to ‘work on’, more like territories to be in. This can also apply to individuals within campaigns. I think of first category as ‘hunters’ and the second as ‘farmers’. For the hunters, the ‘world is their oyster’: they can select a target, try to change it to make a difference and then move on. 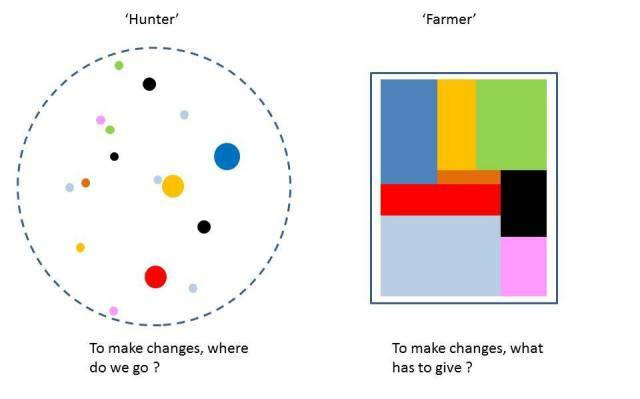 The ‘farmers’ err towards wanting to tend and cultivate change in a set area. To use a military analogy, the first are more like raiders, the second want to hold and defend ground. In reality of course both encounter limits imposed by resources and opportunities but in very different ways. That affects the assumptions they make before they even embark on considering campaign options. The ‘hunters’ see a universe or landscape of potential targets. Picking one rather than another does not necessarily imply a trade-off except because you can’t be in lots of places at once. In the ‘farmer’ case, allocation of resources is ‘zero sum’ and any change implies shrinking effort somewhere else, so campaign planning becomes negotiated more like a budget than a journey. Managers may accidentally build in such frames of thinking by the way they organise campaign teams, ‘department’s, planning processes and resourcing. Repeat Business or Venture Capital ? At the level of governance and senior management a fairly common problem comes about when managers, trustees or funders demand that campaigns meet the same sorts of performance targets or predictability that you can ask of ‘repeat business’. The problem is that although the skills and techniques used in composing campaigns can be optimised within any organisation (ie you get good at it), each new campaign tends to be a bespoke operation, a voyage into the unknown, a venture into new territory. Hence it is an inherently high risk business, more like venture capital than a service function or other repeat business. Decision-makers used to service-delivery with established metrics for say economy and efficiency, or probability of outcomes, may expect to apply them to campaigns. Service-delivery charities that ‘take up campaigning’ are especially vulnerable to this, and if this also comes with a failure to set campaign change objectives at a realistic level (more about that another time), it creates a whole cascade of problems. How embedded are you in society: how connected and established or accepted ? Being highly embedded requires the use of a lot of time or other resources and brings great benefits but sometimes also constraints. How efficiently are things done within a campaign, and across campaigns ? And how efficient in terms of delivering results, is campaigning for your organization, as opposed to other means of delivery. By and large, campaigning should be a last resort as most other options are likely to be lower risk. How cheap is it ? Many other things tend to be cheaper, and campaigning is replete with opportunities for false economies, such as not bothering to do research into what might work, before planning to ‘roll out’ campaigns. Are the campaigns, or is this one, effective ? A huge amount of frequently futile effort is put into ‘campaign evaluation’: futile because although what people usually want to know is ‘did it work ?’, if there is no well-defined critical path of detectable objectives, ‘evaluations’ end up measuring proxies for change instead of actual change. In terms of relative priorities, campaigning usually merits prioritizing effectiveness over economy or efficiency. Which is another reason why it’s better to only campaign when absolutely necessary, and other avenues have been exhausted. Campaign groups are almost by definition likely to be up against a more powerful opponent. Greater agility ought to be one of their few ‘natural’ advantages but some organisations design it out by looking to prioritize factors such as consistency or satisficing of stakeholders. Genuine agility within a campaign is usually about capacity for tactical redeployment, re-assignment of effort or otherwise ‘getting inside the loop’ of an opponent (see OODA). A not-bad rule of thumb in campaign planning sessions that if a concept does not excite people inside the organisation, it should not be turned into a campaign. The idea everyone cannot stop talking about, even if it is controversial or poses a dilemma, is more likely to work than one everyone agrees it is important and ought to be done but which is very low energy. Many campaigns require contagion, a term often applied to the spread of an idea or behaviour but which just as important, can be the spread of a common focus of attention. This is one way things start ‘trending’ and issues are organically ‘promoted’. It’s easy to see that a campaign group which automatically aligns itself to every ripple in the zeitgeist, every twist in ‘fashion’, may be led far from its carefully charted critical path which leads to the ultimate objective. On the other hand, being seen as responsive to the public mood and concerns tends to make an organisation liked and trusted, and NGOs are in competition with politicians to achieve this. The real challenge is develop the critical faculty to spot, and the skills to exploit, opportunities to harness the public mood in ways that move a step along a strategic pathway. It is strange how little systematic attention many campaign groups seem to give to simply being good at what they set out to do. Being good at campaigning requires skills that cannot just be gained through reading books, attending courses or ‘sharing’ expertise. How much application leads to competence in campaigns is unknown but I at least would always favour hiring campaigners with a track record of delivery or overcoming identifiable obstacles through their own efforts, as opposed to those with a long string of more theoretical qualifications. 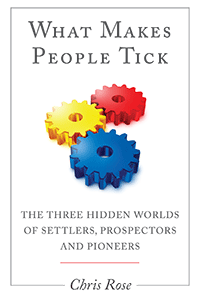 Then for organisations to become good at campaigns requires management to build a machine of people that works. An intelligencer is an old word for someone or some group that acquires and passes on ‘secret’ information in a way that makes a difference. Surprisingly few campaign groups are good at this, or to put it another way, many are much less well informed than they could be, about what might make a difference in their chosen field of operation. Many simply react to information that others have already put into circulation, for instance in the media or social media. ‘Secret’ in this context may mean information that is deliberately kept from public view but is more likely to be information that is simply not widely known or scrutinized but with some effort, could be discovered and used. A campaign may leave the development of a ‘following’ to chance or there may be a deliberate choice to invest time and effort in it. It’s not hard to see that the size and relationship-quality of a following then affects the ability of a campaign to ‘deliver’. Nowhere is this more true than when Real Life human activity is required, as in political canvassing and other forms of political ‘organising’, in ‘community’ work where committed messengers are needed, in organic human outreach to new audiences and in demonstrations. This may lead to requirements for permeability and accessibility, ie the opportunities to join in. The campaign organisation which has a kit-bag of visual iconography to deploy in constructing its communications is at an enormous advantage over those that do not. These are not ideas or arguments but the means of visual communication, and if the organisation ‘owns’ them, they promote its brand at the same time as doing the day-job of making change. Most of these stem from moments that become stored as memories. Any campaign group which lacks them should consider investing in activities that create such moments but the moments need to be real, and to flow from campaigning as they will not arise from ‘stunts’ or the use of borrowed imagery. Effective execution of campaigns requires discipline, such as when to forgo opportunities to become involved in topical public debates because doing so would feed the media but not further the campaign or your longer term ability to campaign. As discussed above, a campaign group may take either approach but the question really is, which do you set out to become good at, and how effective are you in using it ? In campaigning this means using campaign techniques to produce a practical result in terms of change: following through to the end result, or putting in motion such forces that the end result is inevitable (whether you are seen to do so by others or not). If for instance you use the sequence awareness> alignment> engagement> action, it means following through to action. Advocacy in itself is not (in my book) campaigning, although sometimes people use the words inter-changeably. Advocacy is about making and presenting a case, which is usually a part of campaigning but it’s not about making instrumental changes to the contexts, the messengers, the actions that others take and a host of other things that may be needed to bring campaign outcomes about. Making change can often involve upsetting someone along the way. If you can charm and disarm the unpersuaded or the opposed, rather than have conflict, so much the better. The ability to do so is often the difference between success and failure. Obviously angry groups are rarely attractive. A lot of campaign groups have a surfeit of people with drive and cause motivation but a lack of ability to empathise with others and to ‘put themselves in the shoes’ of others. Understanding values and other psychological metrics can help overcome this but it’s not enough in itself. In MBTI terms this can mean recruiting some high Feeling and Sensing people not just Thinking and Intuitive ones. No campaign has to last forever but any campaign entity has to last long enough to see the thing through. This is why most effective campaigns are run by organisations which have a funding and institutional base. How scalable is a particular campaign or step in a campaign, if a bigger impact is subsequently needed ? A great campaign which has no subsequent impact or for some reason cannot be taken to scale, is generally a poorer investment than one which is an easily replicable model (or better, self-replicating).